A gap between two teeth is also called a diastema. Gaps between teeth typically show between the two upper front teeth, but gaps can occur between any two teeth in both children and adults. Why do adults or children develop gaps in their teeth? Differences in the size of the jaw bone and the size of the teeth, which can cause an extra space between teeth or teeth crowding. Missing teeth or teeth that are too small resulting in neighboring teeth moving around. Movement may close one gap, but can also create new gaps. The tissue that extends from the inside of your upper lip to the gum is called the labial frenum. If it’s overly large, it can create a gap. Thumb sucking can create a gap when it pulls the front teeth forward. Swallowing reflex abnormalities can cause gaps. When your tongue presses forward against your front teeth as you swallow, instead of the roof of your mouth, this continuous tongue pressure causes front teeth movement and gaps. Gum disease may cause a weak and/or receding jawbone. Since your jawbone supports your teeth, loss of support can cause teeth to loosen and move. How do dentists fix gapped teeth? There are a variety of ways you can have gapped teeth corrected. The method(s) your doctor will recommend depends on the severity of the gap(s). Invisalign is a set of custom-fit, clear, plastic trays that moves your teeth much in the way braces do, but the trays are more comfortable than braces. Since the trays are clear, they look better cosmetically. Using a series of trays, they slowly and precisely move your teeth into place. Invisalign can be used to close one or many differently sized gaps. Braces are a type of orthodontics like Invisalign, but they are much more noticeable and can be uncomfortable. Braces can be used to close one or many differently sized gaps. Crowns are a type of porcelain shell, and they fit over most of the tooth. Crowns can fix cosmetic issues, such as gaps, but can also correct functional issues, such as broken or decayed teeth. Veneers are also porcelain shells, but they are placed over the front of your teeth. There is a bit of enamel removed from your teeth so the veneer looks natural. Dental bonding uses resin that is color-matched to the shade of your natural teeth to fill in slight gaps. Dental implants can be used to fill in a gap that is as wide as a tooth. Implants are teeth attached to titanium posts that are surgically embedded into your jaw and fuse with your bone. At Dental365, our compassionate doctors provide personalized care to you or your child to create a beautiful smile and a healthy mouth. Our multiple office locations make dental appointments convenient. 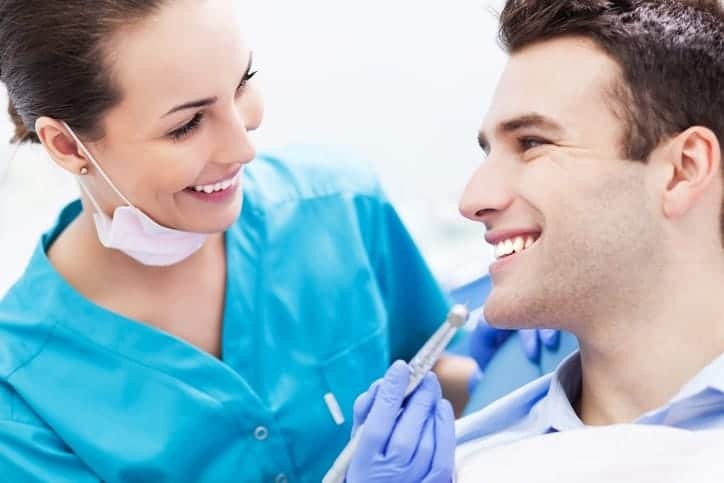 If you’re seeking help with gapped teeth or any other dental issues, contact us for a consultation to achieve your goals. Fill out the form on this page to request an appointment or call 844-365-DENTAL to learn more.